My baby? Is a big baby. At 7 months old, he's a husky, roly-poly, chubby-cheeked, fat-thighed chunk of Gerber baby who looks nearly a half year older than his age. He is, as his doctor said at his last post-natal visit, robust. Which is not surprising, because he nurses more or less around the clock. I mean, he was big to begin with, but a steady diet of booby has kept him on an upward curve on the growth charts. Which is great and all, but I'm getting a little tired of being the sole source of nutrition for a ravenous jumbo-tot. The problem is, he won't take solid food or a bottle or indeed any source of nutrition that does not come wrapped in a nursing bra. He just won't do it. I've tried. I try every day: rice cereal, oatmeal, mashed fruits, mashed veggies, mashed fruits and cereal, mashed veggies and cereal, cereal with formula, formula with cereal, cereal with expressed milk, everything. But if it comes on a spoon or in a bottle, he just won't take it. He'll actually grab the spoon from me, shake the food off, and then gnaw cheerfully on it until I wrestle it away from him again and try to slip a little cereal into its bowl, at which point he hoots angrily, grabs the spoon, shakes off the cereal, and we start all over again. If I manage to get any into his mouth without him grabbing the utensil away - it just seems wrong, a little too close to waterboarding or some other Guantanamo-like exercise, to hold his arms down for the purposes of getting the spoon in - he makes a sour face and tries to push it out of his mouth. It's a little frustrating. It's a little frustrating because I suspect that a rapidly-emptying belly is what keeps waking him up at night. I just don't think my humble boobies are up to the task of keeping him filled for hours at a stretch. He's a big guy, and I imagine that he's got a big tummy tucked away in that pudgy belly of his. A big tummy that I can't fill. I've read that some babies just aren't ready for food until closer to eight, nine, or even ten months. I've read that breastmilk is sufficient for most babies in their first year. I've read that some babies bypass soft foods altogether, and refuse to eat anything until they're ready for more solid varieties of solid food (Jasper does, I should note, like organic teething biscuits. He holds them in his hand and gums happily away until they've turned to mush.) I don't think that there's anything wrong him - at least, I hope that there isn't - but I am at the very end of my coping-rope and will soon reach the point of utter collapse if I don't get a full night's sleep soon. And because it has become clear to me that he is waking from hunger, I need to deal with his hunger before I can get some rest. I need that rest. I need that rest BAD. UPDATE (Sunday): HE TOOK A SIPPY CUP. REJOICE. When I was seven years old, my family went to Disneyland. My father took a few weeks' holiday from work, and we set off in a camper van down the Pacific coast from Vancouver, stopping to see attractions like the Grand Coulee Dam ('the Eighth Wonder of the World!' exclaimed my mother, reading from a promotional pamphlet. 'Bigger than the pyramids!') and making detours into Nevada and Arizona to visit Death Valley and the Petrified Forest. We stayed at state parks and KOA Kampgrounds. It was awesome, at least until I got mumps on the way back and had to sit, fat-faced and forlorn and bundled in a blanket at the side of the campground pool while my sister and parents splashed and enjoyed the last days of our holiday. 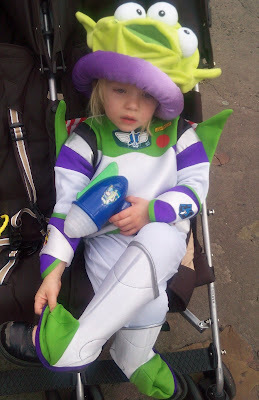 Disneyland was the highlight of the trip, but in truth I remember very little of it. I remember the most notable attractions - Pirates of the Caribbean and the Haunted Mansion and the Peter Pan ride and the Country Bears Jamboree - and I remember making a wish in Snow White's wishing well, although for the life of me I can't remember what I wished for. I also remember some ride that made you think that you had been shrunk to smaller than a snowflake, and remember that my sister, then four, emerged from the ride in tears, devastated because, she imagined, her lollipop had shrunk along with the rest of us. Mostly, though, I remember my mother's childlike delight as we explored the park. The rides amazed and thrilled her; she insisted that we visit the Pirates of the Caribbean again and again, exclaiming every time our little boat navigated its way between the battling pirate ships - cannons! exploding! - that it was so exciting! So real! The Mad Hatter's Tea Party with its spinning teacups made her dizzy, but the Haunted Mansion delighted her (ghosts! right there in the car with us!) and she clapped and cheered her heart out at the Country Bears Jamboree. I was, at seven years old, convinced that my thirty-something mother was having a much better time than I was, and I was almost certainly correct. My mother insisted for years that the wonders of Disneyland were as potent for adults as they were for children, but I always doubted her. One of my mother's signature personality traits has always been her childlike enthusiasm for anything fantastical, and it seemed to me that Disneyland was very probably as close to a spiritual homeland for her as any other place in the world. So I was always doubtful when she insisted that Disneyland was as magical a place for grown-ups - even sensible, non-silly grown-ups, like the kind that I knew I would grow up to become - as it was for kids. I was right to be doubtful. But, also, I was wrong. 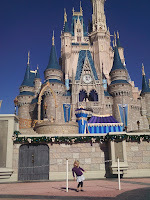 My children and I spent this past weekend at Disney World. We could have gone anywhere in the US (thanks, Motorola), but I chose Disney World. 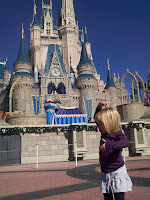 I chose Disney World - against all of my pre-parenthood commitments to myself to do parenthood differently, to make unconventional choices in parenting, to not fall back on the convenience of sparkle and glitz and licensed characters - because it was just going to be me and the girl and the baby and that - combined with the fact that I don't drive - was just too much parenting to be managed anywhere where there weren't ample distractions ready-at-hand. Disney World, it seemed to me, was one big handy distraction. And if what my mother had said was true, then I would enjoy it too. It would be a vacation for my children, and for me. Win-win. And yet, and yet... there was still magic to be found, and I found much of it. Emilia was delighted beyond measure. 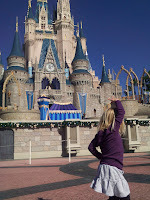 Not amazed, not dazzled - it seemed to her that of course there would be places like Disney World, where all the characters from her favorite movies live and where small children are given stickers and sparkles and smiles at every corner and allowed to race around without restriction, and so, really, what's the big deal? - just delighted. And I, of course, was delighted at her delight. Her delight filled my heart and made it swell to bursting and because it was just so full, so bouyant, it was impossible for me to not have a spring in my step, even with the jumbo baby strapped to my chest and the bag-laden stroller in front of me. I was uplifted. Emilia would, of course, have been delighted with any number of holiday experiences. She would have been delighted if we had rented a camper van and parked ourselves by a beach and set her loose with a bucket. And we'll totally do that. But it was fun, this time, to indulge in a cheesy commercial fantasy, to let her romp in a world constructed entirely for children, one that makes no apologies for childishness and cheesiness and glitz, one that is specially designed to provoke giggles and squeals of delight. So what if I could see the wires behind the animatronic Captain Hook, or see the creases in Cinderella's make-up? This vacation wasn't for me. It was for her. 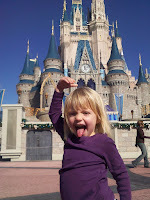 Quick - what's your happiest family-vacation place on earth? I'm already plotting and lobbying the husband for a family vacation for the four of us next year. I'm thinking road trip. Should we retrace the path of my family's Disneyland trek? Or what? Where are some good places on the continent to go? Where would you go? It was fun. It was loads of fun. It was also back-breakingly, mind-crushingly exhausting, but you don't take your children to Disney World if you're hoping for any relaxation for yourself. You don't do it for yourself at all. But you sure as hell take a little vacation in your bed when you get home. I'm going to sleep hard.